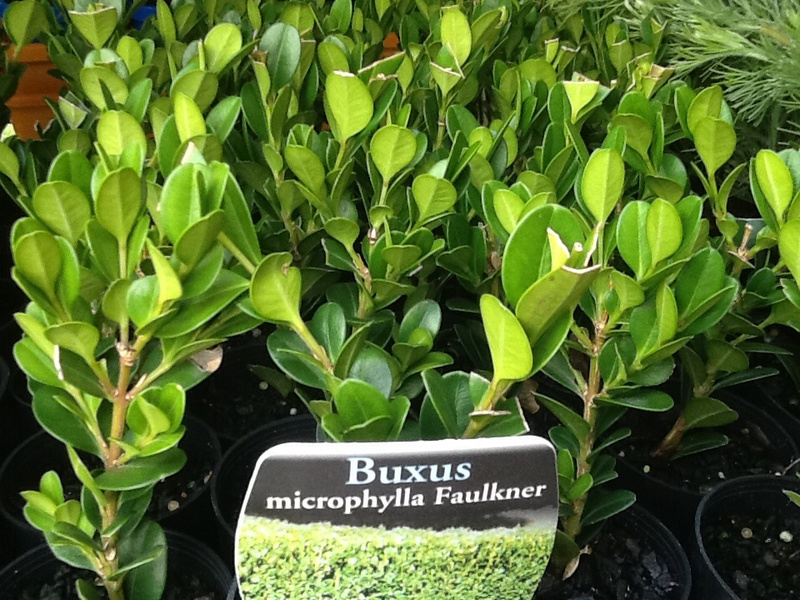 Buxus semervirens ‘Faulkner’, Dwarf Japanese box. sometimes called microphylla. An excellent box cultivar with dark, glossy foliage and a dense branching habit. Suitable for use in a number of sites for topiary or hedging. Mature H x W to 1oocm. Upright branching, dense small shrub. Glossy, dark green leaves, often becoming bronzy over winter. Insignificant, creamy flowers in mid- to late spring. Male and female flowers separate. Very hardy. Prefers moist, well drained soils in a position receiving full sun to part-shade. Irrigate in hot, dry conditions. Leaves may brown slightly in dry, windy conditions. Avoid excessively wet positions. Clip regularly when young if being shaped for formal hedging.